The new marketing campaigns seem like they are working. Traffic is up – way up. But, purchases are lagging. That big increase in visitors isn’t translating into sales. Why not? What’s going on? As the resident web analytics guru, your company is counting on you to figure out why more traffic doesn’t automatically mean more sales. You know that the new campaigns are sending visitors who don’t engage with the company’s brand. But, how do you quantify engagement? And how do you measure where your engaged visitors come from so the marketing team can adjust their campaigns to attract the right audience and get more of those folks to your site? This post looks at how Google Analytics Events can be used to track engagement and provide the data you need to better target campaigns. The latest upgrade to Megalytic focuses on improving the readability of reports, enhancing date comparisons, and improvements to the user interface for building and editing reports. Darker, crisper fonts and sharper borders make reports even more attractive and easy to read. Here’s an example of the Rolling Average chart showing how well all the elements “pop” off the screen and printed page. This upgrade went live on October 24. You can start a free, 14-day trial (no credit card required). If you already have a trial account, and it has expired, please contact us to get your trial restarted so you can check out these new features. Date range comparisons for time series charts. Demographic data in charts and tables. 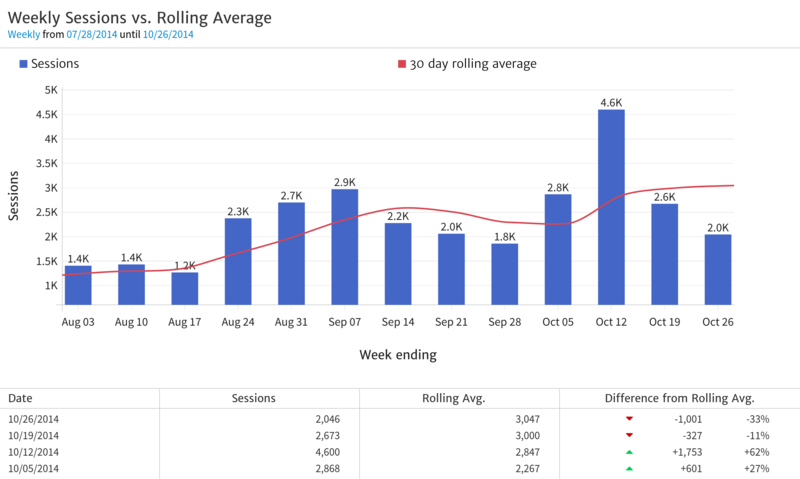 Multiple Goals Widget for charts or tables comparing performance against multiple Google Analytics Goals. Customizing the default connection names. Your public relations (PR) team is celebrating. They just placed an article on the front page of TechCrunch and its driving huge traffic to the website. It’s great news, of course. It’s a verifiable PR homerun! But, as a web analyst, you want to know more about the traffic that’s coming in from that article. Are those visitors engaged? Do they come back? Do they convert? What is the value of the placement to the business? In the coming days, you’ll be able to measure the effect of this placement. As the data guru, your job is to identify the most effective campaigns and share that information with your PR team to help them produce the biggest bang for the marketing dollar. So, how will you communicate that analysis effectively to them? To be effective, your report to the Public Relations team must present a clear picture of the quality of the traffic they generated, as well as the volume. This post shows some ways that you can do that. You’ve spent hours putting together an incredibly in-depth analytics report. Page after page, you carefully laid out details like where users came from, how they navigated the site, which sources converted, how organic traffic is trending, etc. You proudly send the report off to the CEO, anticipating positive feedback on your thorough analysis and presentation. Don’t get frustrated. There isn’t time. You need to rework the report from the ground up, this time only showing a few of the most important statistics. I know. It’s a common and frustratingly vague request. But, if a business has invested in implementing Google Analytics Ecommerce tracking, chances are they expect regular reporting to track progress and deliver insight about what’s working and where improvement is needed (if they don’t, that’s a whole other concern…). A good Ecommerce Report not only tracks revenue earned on the website, but delivers insight into where the revenue is coming from – which demographics, marketing channels, geographies, etc. This information is all available in Google Analytics, however, it is a lot more difficult to put it into a report format that would please a boss or client. That’s where Megalytic can help. Megalytic provides a set of Ecommerce widgets that you can customize for your needs and arrange into a comprehensive Ecommerce report. Dear Larry Page, Please Save Google+ !!! Google+ has become an awesome little social network that just might need saving. Journalists love to hate on Google+. The TechCrunch article Google+ Is Walking Dead made a big splash in April. Then there was ZDNet’s article at the end of June: Google Plus: three years old and still failing as a social network. And, most recently, there has been speculation in Forbes that the end of Google Authorship means that Google+ is next on the chopping block. Google+ might be killed off? Say it isn’t so Forbes! Google+ is a great place to build community and drive engaged traffic to our websites. As digital marketers, social media managers, community builders, and small business owners, we need Larry Page to Save Google+ !!! But will he? Whether you’re an agency professional or you work in-house, it’s up to you to craft the right report, for the right person, every time. And that includes creating reports that bring value and will be understood by the sales people who work among us. A sales leader is a valuable asset to any company because he or she cares about one thing – revenue. This person isn’t concerned with your bounce rate, nor what Google says about your time on site. The salesperson is focused on actual revenue, whether directly connected to the website or not. They’ll also want to know about possibilities for future revenue, or revenue that may be coming down the road. Your job as an analytics professional is to show the salesperson how the website, and other marketing activities, contributes to sales and lead generation. Thankfully, Megalytic provides many built-in widgets to help show ecommerce success. Whether your site is B2B or B2C focused will determine how you structure the report. Below, we take a look at each scenario. "Where does engaged website traffic come from?" At Megalytic, we’ve taken a crack at answering this question. We analyzed millions of visits to more than 1,000 websites to identify where, on average, the most engaged traffic comes from. This is the first in a quarterly series where we will be investigating what really works when it comes to attracting quality traffic to a website. Many of us put a great effort into creating and continuously tweaking AdWords campaigns. Writing ads, selecting keywords, optimizing bids – there’s no end! So, how can we show the impact our campaigns are having? Or, the improvements we’ve made? In this post, we look at how to use Google Analytics to pull together the data that measures the effectiveness of AdWords campaigns. In addition, we’ll look at how the Megalytic reporting tool can work with your Google Analytics data to produce reports that better showcase your success.